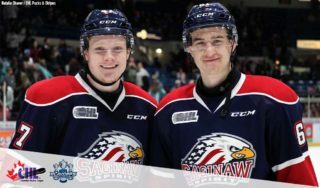 Saginaw, MI – Saginaw Spirit head coach Chris Lazary was impressed with his fourth line on Saturday. So much so that they were rewarded for their efforts with the start the next day. 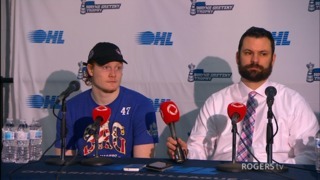 After combining for two goals and three assists against the Erie Otters, Jake Goldowski, D.J. 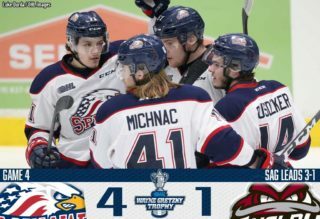 Busdeker and Danny Katic led the charge in the final of a back-to-back at The Dow Event Center and second time hosting the Windsor Spitfires in seven days. It’s all part of Lazary’s sentiment of depth being the biggest strength for the Spirit, who have gone without a loss at home dating back to December 14. With depth comes offense and it appears just about everyone is contributing lately. Busdeker, Cole Perfetti, Bode Wilde and Blade Jenkins each had a goal in Sunday’s 4-1 win to put Saginaw within one game of tying their season win total (29) in 2017-18. At 60 points and just five back from the Sault Ste. Marie Greyhounds for the OHL West Division lead, the Spirit remain in the third place in the Western Conference as they prepare for a five-game road swing over the next two weeks. On Sunday, an eight consecutive first-goal streak Saginaw came to an end at 9:23 in the first period. From the top of the slot, second-year forward Daniel D’Amico sniped it over the left pad of Ivan Prosvetov, picking up his 19th goal, third-most among Windsor players. D’Amico has recorded five goals and seven points in seven games played against the Spirit this season. The 17-year-old forward is on a 10-game point streak. Colton Incze would get the start in net for the Spitfires, stopping 10 shots before allowing two straight goals to Perfetti and Wilde going into the intermission. Perfetti’s game-tying goal at 15:36 came off a scramble in front of the crease. Sliding it through the bottom-right corner, Perfetti is tied for third with Marco Rossi of the Ottawa 67’s for most goals (18) and points (38) among OHL rookies this season. Three seconds into Saginaw’s one-and-only power play in the first saw Wilde add the man-up goal with 2:26 left. Coming into the game ranked in the top-five in all three major offensive categories as a league blueliner, Wilde fired a one-timer at the top of the circle for the go-ahead lead and his 12th goal of the year. Perfetti and team-leading scorer Cole Coskey were each credited with the assist. It’s the first multi-point outing for Pertetti since January 2 against the Flint Firebirds. Saginaw has the sixth-best power play unit through 44 games with 37 goals scored for a 24.5 percent success rate. A scoreless second frame included minor penalties being traded and Prosvetov making 16 saves. The 2018 Arizona Coyotes fourth-round (114th overall) draft pick finished with 44 stopped shots for his 23rd win this season and 11th in his last 12 starts. Born in Moscow, Russia and a 2018 OHL Import Draft first-round (18th overall) selection, Prosvetov has moved into a tie for second place with Niagara IceDogs’ Stephen Dhillon for most wins among league goaltenders. Prosvetov and Dhillon also hold the second-most shutouts (3) behind only 2017 Buffalo Sabres second-rounder Ukko-Pekka Luukkonen (4). Penalty killing by the Spirit improves to third on 28 goals allowed for a 81.6 percent success rate. Jenkins would break the stalemate at 12:34 in the third period with his 18th goal and second multi-point performance in three games on the shortside. Drafted by the New York Islanders in the fifth-round (134th overall) in 2018, Jenkins is fourth on the team in points (43) and fifth in assists (25) after adding the secondary on the Perfetti goal. Crossing center-ice before targeting the empty net once Windsor pulled Incze, Busdeker topped off the victory with 2:18 left. The Dexter, Michigan, native has 11 goals and 18 assists for 29 points this season, securing Saginaw’s third win against the Spitfires in the last four games. The first-of-five straight road games begin next Thursday, January 24, at the Peterborough Memorial Centre against the Peterborough Petes. 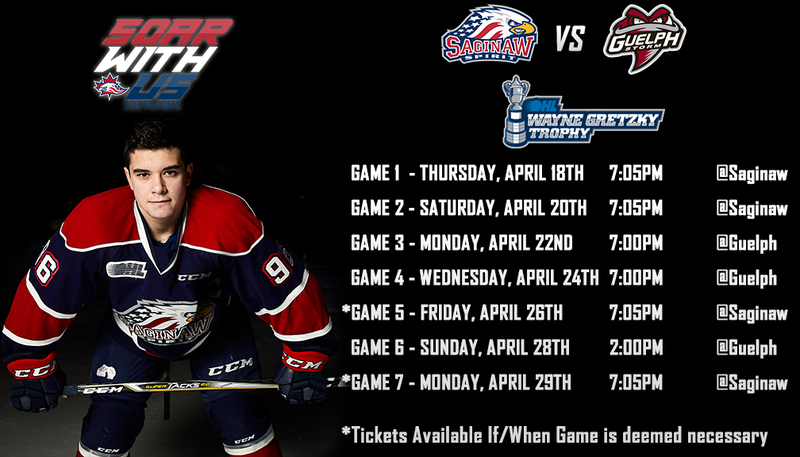 Thursday will mark the first of a two-game regular-season series between the Spirit and fifth-place Eastern Conference standing foe, who’ll meet again on March 3 at The Dow. In the last eight games since 2013-14, Saginaw has gone 4-3-0-1. Live coverage is on the flagship WSGW 100.5 FM Talk & Sports and fmtalk1005.com with Joey Battaino and Dennis Desrosiers.